If you are one of the many people who find going out without your BlackBerry a bit like going out before you finish dressing, it is very satisfying to find yet another great BlackBerry app that meets a need perfectly. This review of ultimate BlackBerry applications will help you find the best BlackBerry app solution to many of your needs – one that does a better job than what you were previously using. developers writing applications for the BlackBerry which are available through other vendors. 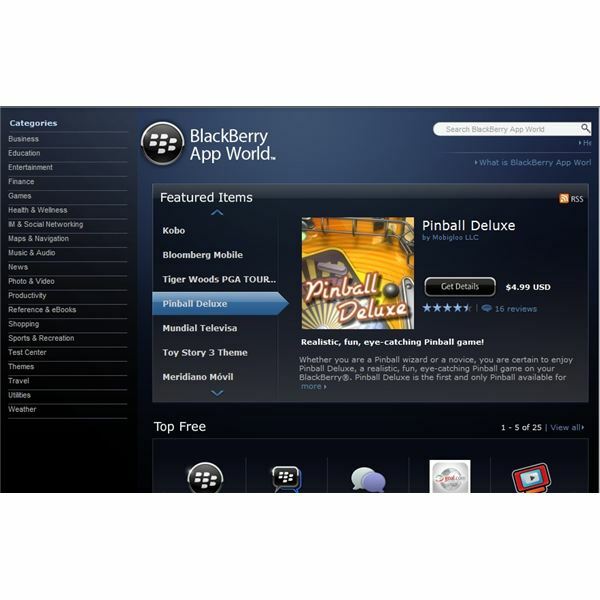 BlackBerry App World can be accessed through the Research in Motion site, and has an app you can put on your BlackBerry to search for new apps. Once you have BlackBerry App World on your Blackberry, you will also be able to receive updates information for any BlackBerry applications you have. Knowing how to remove an app you don’t want is very useful. In How to Uninstall Blackberry Applications, there are simple directions for removing those unwanted or obsolete applications from your BlackBerry. Your BlackBerry is capable of much more than keeping your email at your fingertips or making phonecalls. It is never going to replace a dedicated MP3 player, and the sound may not be as high quality either, but for music or other media on the go, your BlackBerry can provide a reasonable substitute. Do you want to listen to music? Didiom is a free application that allows you to stream music from your PC to your BlackBerry. Storing pictures in your wallet of family and friends is a very traditional activity. Keeping them on your phone is an updated version that can keep those snapshots handy in quantities that would stuff your wallet. Do you use your phone to take pictures while you are traveling? These inexpensive photo editing applications let you do editing on the go. Mini Paint and Picture Magic are each $4.99, while you can get Doodle for just $2.99. Read a review of these basic photo editors for the BlackBerry, and see which will suit your needs. There are several applications for reading on the BlackBerry, and this review looks at the pros and cons of the Mobipocket eBook reader for mobile devices and Windows. While not a perfect interface, books in Mobi format are not too hard to find, and you can read on the BlackBerry and your computer with this free application. Mobipocket is now offering an over the air bookstore for BlackBerry owners. Do you have audiobooks? There are often times when you cannot look at your BlackBerry, and this app allows you to download and listen to Talking books with Audible for the BlackBerry. You can stream or download books onto your BlackBerry. Twitter is a part of life for many – like your Blackberry. Whether you keep up with your friends or keep them posted with the latest in your life, this article looks at five current Twitter applications for the BlackBerry, and rates them. Arnold looks at BlackBird, Uber Twitter, Seesmic for BlackBerry and more and assesses how they work with Twitter. Do you do more social networking than Twitter occasionally? ShoZu Lite allows you to stay in touch with almost every major social site you can think of: Flickr, Facebook, Twitter, Blogger, Photobucket, WordPress, Picasa and more. You can put up pictures, send messages, write on the wall, and make sure all your friends are in the loop wherever they are. ShoZu Lite has you access each social site you use and give it permission to interact with the site – a one time process. Read this review and see if this is what you have been looking for. Where are you? Your BlackBerry knows. Where are you going – and how long will it take to get there? Need to keep a running total of your finances? Once that’s gone – time for some fun. Your BlackBerry has you covered. No matter where you go – there you are – if you have your BlackBerry on hand, and the GPS on. Here is a collection of great GPS apps for the BlackBerry. WHERE is a free application, and it tells you the location of things around you. In a new town? WHERE will let you get around like a native. NavFunPro works with Google Maps to let you travel over off the road terrain and even find out the weather. There are severeal well reviewed applications for helping organize your financial life on your BlackBerry. For day to day finance, there are a couple of reputable apps. The first is a free app, PageOnce for the Blackberry: Control your financial life on the go. The application allows monitoring of investments and your bank accounts, tracks frequent flyer miles, and keeps tabs on your cell phone minutes. You can set up notifications for bill due dates and card expirations. If you want an app that tracks your finances, and can be set to perform them, check the review for the SplashMoney App. It is not a free app, available for $30, but it allows a great degree of customization for your finances. A less expensive financial manager for the BlackBerry is the Expense Manager from Total WIreless. It is aimed at helping you track expenses while traveling, replacing notebooks, scrawled envelopes and wadded receipts in your back pocket. It is priced at $15.50, and has a trial version. Games come in many types, and some of them are not suitable for a BlackBerry. The good news is that there are many games which are great on the Blackberry. At Bright Hub we have done the work to find you games that suit any fancy, without you needing to do any searching. Want games to play with your children, or for them to play by themselves You need look no further than your BlackBerry. There is a Transformer’s game, among those that kids and adults can both enjoy. Also in this review of the Top BlackBerry games for Kids are Sid Meier’s Pirates and Kung Fu Panda, which has been given a 5 by our Bright Hub reviewer. In this review Bright Hub looks at the top free games for the BlackBerry, Included are Number Cruncher, given a 4 out of 5 by our reviewer. He says this game is a combination Sudoku and Tetris. Also on the list are Ka-Glom, BeZombied, Mobile Wars, Vampires Rising, Dots and Octopuzzle. These cover a variety of game types and – since they are free – you can try all of them out, and keep your favorites. If you would like to take a look at other game reviews, check this search for BlackBerry Games.